OK, I have a few ideas for improvements. First, horizontal scrolling is in, but I must have the option to only scroll horizontally, too. The spawn-lines will be spawn-points then. If the point becomes visible, the enemies are spawned. Same for the End-of-level. Must be a point that comes visible and the level is over. 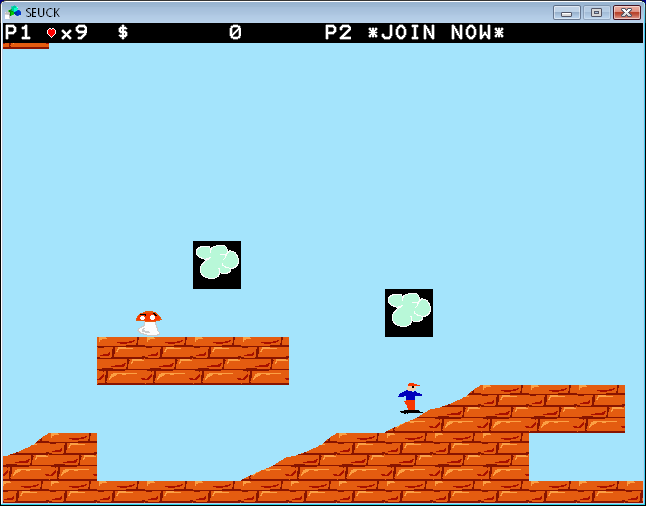 Next, if you have horizontal, you need gravity, and thus, a jump-button and jump-power. Also options about "constant jump height, or Mario style, and direction change while jumping/falling. Will this be too complicated? Then, I need an option to make upgrades/specials. So, if you want to remake SuperMario, there must be an option to have the extras move around. In a first version, maybe it's enough to allow an enemy to "drop" some extra when he's dead. You could place an enemy that looks like background then to ave the "jump up to get power" blocks. Might work. The main problem is: how to handle the extras? Like: attach a "player definition" to some extra, and when you collect it, your player changes? That way you could enter a tank, like in IKARI. But when will you loose it? Options: OnOuch, AfterSomeTime and AfterLevel, maybe? I'm really excited about what ideas you might bring. Works a treat now. Also, you can change the colours in the palette now, which is was very much missing. I made the drawings feel much faster and you can craw continuous strokes now (I connect last position-new position with a line instead of "setpixel" now (internally it's all working on an array, the image gets created on the fly) ). OK, Update. Fixed bugs with jumping/animations. I'll make a video soon, it's really getting fun now. I liked SEUCK back in time! Good work, i enjoyed it. That is really bad. You need a newer gfx card.